by Clarkson, Kenneth W., Miller, Roger LeRoy, Jentz, Gaylord A.
Clarkson, Kenneth W., Miller, Roger LeRoy, Jentz, Gaylord A. Now in its ninth edition, this text brings to life the functions and inner workings of business law in the real world through the extensive use of case studies. 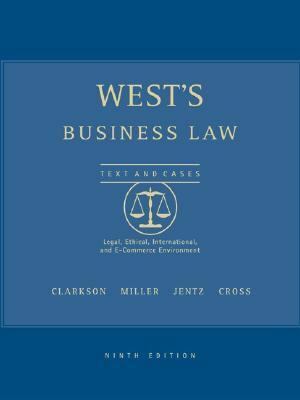 There is also a supporting Web site for this title.Clarkson, Kenneth W. is the author of 'West's Business Law Text and Cases', published 2003 under ISBN 9780324152821 and ISBN 0324152825.